Click the button below to add the ALESIS VORTEX Wireless Keytar Electronic Keyboard Instrument Synthesizer $10 Instant Coupon use Promo Code: $10-OFF to your wish list. Take back the stage and experience untethered, wireless keytar performance with the Alesis Vortex Wireless. This dynamic keytar controller connects wirelessly to your computer and integrates with popular virtual instruments, plugins, and DAWs. For maximum stage and studio mobility, the PC- and Mac-compatible USB dongle uses a single USB port to create a reliable, wireless connection. Fastened with a piano black finish and intuitive ergonomic layout, Vortex Wireless offers comprehensive controller functionality in a stylish and stage-ready design. Create dynamic, expressive performances that the audience will both see and hear. Vortex Wireless offers unparalleled expressive control with an onboard MIDI-assignable accelerometer. Map the accelerometer to any software parameter, and create music that adapts to your performance. Glissando, pitch bends, vibrato, filter sweeps, and additional expressive actions can be conducted by simply altering the orientation of the Vortex Wireless. Now the sound of your music can match your performance style. Command the stage with 37 velocity-sensitive keys with aftertouch, 8 velocity-sensitive drum pads, and a row of physical knobs all laid out in an accessible, hands-on design. A series of neck controls provides further performance options: tweak sounds using the MIDI-assignable touch strip, expand melodic ideas with the octave range buttons, and activate sustain all while your right hand remains free to play. Vortex Wireless offers multiple connectivity options and comes equipped with USB-MIDI and MIDI Out. Vortex Wireless comes bundled with a versatile, high-definition virtual synthesizer designed specifically for it. The Vortex I, by SONiVOX, expands the sonic pallet of your Vortex Wireless with ambient pads, edgy leads, wobbly basses, and more. Vortex Wireless interfaces directly with the software so you can tweak your sounds to taste from any place on stage. For performing, producing, and improvising, Ableton Live Lite Alesis Edition is included and enables you to explore your musical ideas in real-time. Also included is Ignite, by AIR Music Tech, a powerful piece of music creation software that lets you compose, write, and record songs with a straightforward workflow. Make the most of your Alesis Vortex with the free Vyzex Vortex patch editor software. Clear, concise, and easy to use, this point-and-click patch editor software brings quick and precise programming to your Vortex patches. With Vyzex Vortex running on your Mac or PC, use the mouse or keyboard or both to quickly configure any parameter of any patch on your Alesis Vortex. Save and load all of your Vortex patches to and from your hard drive for easy backup. 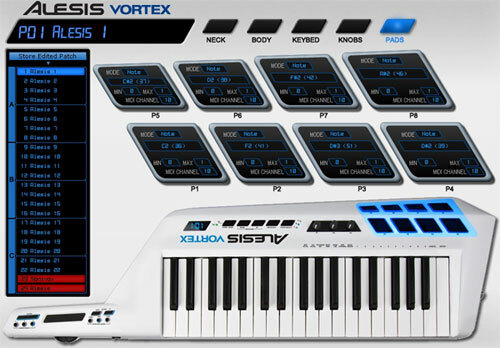 The Vyzex Vortex patch editor software allows both beginning and advanced MIDI users to easily achieve the full potential of their Alesis Vortex keytar. Make the most of your Alesis Vortex with the free Vyzex Vortex patch editor software.